BAMBARABANDA is a unique group, one that synthesizes an authentic approach infused with a strong cultural identity, nourished by musical traditions of the Andean regions of Colombia and South America in a fusion of universal rhythms. Leading a project involving various forms of expression, the group labors constantly toward creating works with a profound artistic sentiment. Since its beginning in 2000, BAMBARABANDA has worked as a collective which, through diverse avenues of expression, has created an experience melding music, theatre, visual art, design and audiovisual concepts. Aiming to project its musical statement throughout Colombia and beyond, in 2008 BAMBARABANDA released its first recorded project, an independent endeavor titled EL BAILE DE LOS OBLIGADITOS. In 2009, the group was invited to participate in ROCK AL PARQUE, considered one of Latin America’s most important alternative music events, earning the recognition of being the biggest revelation (BANDA REVELACION) of the festival. In the same year, BAMBARABANDA was nominated for Colombia’s respected PREMIOS SHOCK, winning honors in two categories, including Best Alternative Band. In 2010, the band received the top award at the SUBTERRANICA COLOMBIA Awards for Best Live Show and was invited to participate at SXSW (South By Southwest) in Austin, Texas. 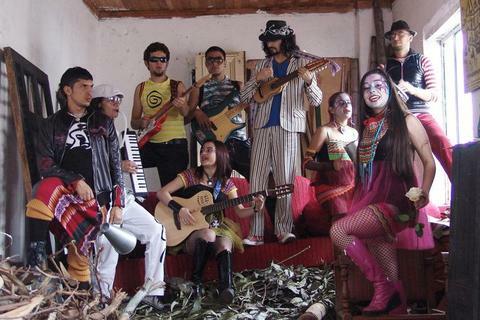 BAMBARABANDA’s live shows are characterized by the group’s lively and very theatrical movement, colorful set and costume designs, impacting visual projections which come together with music that is poetic yet circus-like in its atmosphere while expressing the distinct Andean flavor of its native city, Pasto. Thanks to the many years of dedicated labor and diverse performance experience, BAMBARABANDA has crafted a show apt for very varied types of events and audiences. BAMBARABANDA’s music is a very unique fusion of traditional styles from Southern Colombia, including Sanjuanito, Huayno, Kapishka, Son Sureño, Tinku, Pasillo and Bambuco with more universally known styles such as Rock, Funk, Punk and Polka to name a few. In the end, the musical exchange of its arrangements represent a very unique and original style which has been called “Rock Fusión de los Andes” or Andean Fusion Rock. The group’s musical instrumentation includes drumset, timbales, congas, bongos, bass, electric and acoustic guitars, violin, charango and banjo in addition to accordion, pan flutes and vocals. EL BAILE DE LOS OBLIGADITOS, the group’s first album, was the result of nine years of musical experimentation. The songs included in this release represented many points in the band’s evolutionary process and were recorded live in order to retain the unique flavor of the band’s live show. The album was released on September 26, 2008 in Pasto’s Teatro Imperial. After the well-received first recorded effort, BAMBARABANDA continued experimenting with sounds from other latitudes while maintaining its distinct Andean flavor. Under the direction of Los Angeles-based producer Alberto López (Belú Music) and Yeimy Argotty, the group’s musical director, the group recorded its second album, titled ADNABARABMAB, once again live in Estudios Audiovisión (Bogotá). The resulting musical adventure was mixed by Alberto López and mastered by GRAMMY-winning engineer Joel Soyffer at Coney Island Studios (Glendale, CA). The album will be released on November 11, 2011 in Pasto and will be ready for release in Bogotá and the rest of the world in early 2012.